When John Coghlan left Status Quo in the latter months of 1981 - during rehearsals of new material for the band's 20th Anniversary album in Switzerland, he decided to turn his attention to his own band Diesel. Coghlan had continued to revive his band, on a part time basis since his first performance as John Coghlan's Diesel Band, with a group of friends at the Marquee Club in London back in 1977. 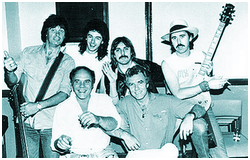 The line up for this debut show had consisted of Coghlan on Drums, with Bob Young on harmonica and backing vocals, Andy Bown playing bass, Gordon Edwards (ex-Pretty Things) on keyboards, guitarists John Fiddler (ex-Medicine Head) and Micky Moody (then with Whitesnake), and vocalist and all-round front man Jackie Lynton. The show was a great success, with the band actually playing for some three hours - although they had actually only prepared and rehearsed a 90 minute set! By 1983, having left Status Quo, John decided it was time to put together a new band as a full-time project. 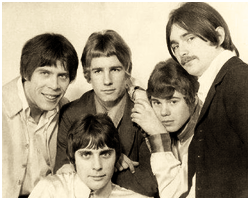 The name chosen for this venture was Stranger - a four-piece band whose line up featured a fine selection of respected musicians, comprising; John Coghlan on drums, guitarist Ray Majors (ex-Mott and British Lions), bass player Ian Ellis (ex-Savoy Brown and Steamhammer), and keyboard player Jeff Banister. The band's potential was obvious from the start and they began their career on a positive note, writing and rehearsing their own original material. Later on in the year John Coghlan teamed up with a trio of other well-known musicians in what was described as a 'side-line' project, called Rockers. The four man line up boasted Coghlan on drums, Phil Lynott (the late great front man from Thin Lizzy) on bass, guitar and vocals, Chas Hodges (from Chas 'n' Dave) on keyboards and Roy Wood (ex Wizzard, ELO and The Move) on guitar and just about everything else - including vocals. This all-star band negotiated a record deal with CBS for the release of a single comprising a medley of rock 'n' roll classic songs - where the individual segments of each number were edited together and coupled with a Roy Wood original composition entitled 'We Are The Boys (Who Make All The Noise)'. The completed medley was issued as both a seven inch or extended twelve inch single under the umbrella title of Wood's own 'We Are The Boys....' title in late November of 1983. Coghlan's next musical project saw him once again working with guitarist Ray Majors, (who had previously worked with The Kinks and Mott the Hoople amongst other bands); Coghlan and Majors were introduced to three musicians with a view to the formation of a completely new line up. With the addition of a change of name to Partners In Crime (inspired by an Agatha Christie novel), the band began working on demo material in the early months of 1994. In addition to both John Coghlan and Ray Majors the line of the new band comprised; Mac McCaffrey on bass, Mark De Vanchque (aka Mark Booty - formerly with a band called Wildlife) on keyboards and vocalist Noel McCalla (ex-Moon and Jody Street). 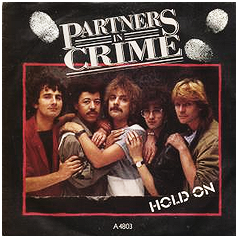 The first Partners In Crime release was a single issued in October 1984 entitled 'Hold On', written by Trevor Rabin and previously recorded by 'Yes' on their 1983 album '90125'. Shortly after the release of this single the band played their first ever live show, at the Marquee Club in London on November 13th. The material included in this live set was a showcase for the tracks which would appear on their debut album. The band actually performed nine of the ten songs from the forthcoming album - playing one song called 'Gypsy Tricks' twice (the second time as an encore). Only one song which the 'Partners' performed on the night would remain unreleased throughout their career - '(Don't Let It) Slip Slide Away'. The Partners In Crime album 'Organised Crime' was finally released in May 1985 and received favourable reviews throughout the music media, who basically hailed the band as a new AOR sensation. However, despite this increasing popularity the record company never seemed to provide the band with the support they clearly deserved - with the result that their album suffered a similar fate to the three singles that had preceded it. Although sales had steadily increased with each new record release, sadly none were destined to reach the charts. No doubt this lack of success was ultimately a major factor in the untimely demise of the band, some months after the release of the 'Organised Crime' album. Coghlan continued to tour regularly with Diesel - featuring an ever-changing line up of musicians, throughout the next three years. Playing mainly pub and club venues the band enjoyed great success as a live band, never failing to satisfy their audiences with a mixture of hard rocking blues based material. Some of the most notable musicians to have passed through the Diesel band during this three year period included; Charlie McCracken (ex-Rory Gallagher), Dave Lloyd (ex-Nutz and Rage), and guitarists Bernie Marsden, Micky Moody and Ray Minhinnett (the two latter men having also worked with Bob Young on various projects for many years). The following month of August saw John Coghlan re-emerge with a new Diesel Band line up, whom it was rumoured had negotiated a record deal with a small UK label for the release of the band's first ever single. The track was entitled 'Licensed To Rock' and was scheduled for release during September of 1988. The line up of the band that would feature on the record was Coghlan on drums, John Verity on guitar and vocals, Jeff Brown on bass and guitarist Ray Minhinnett. Having completed the tour dates with Diesel, John Coghlan decided to put the band on hold once again to enable him to fly to Australia where he would once again work with Alan Lancaster. Lancaster - who had recently departed the successful band Party Boys, had invited Coghlan to join a new band he was putting together with Australian guitarist John Brewster, called the Bombers. John worked happily with The Bombers for a year, but was glad to get back to the UK in 1990. 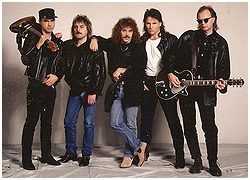 After Australia, in the early 90s, the Diesel line up once again included former Status Quo road manager and songwriter Bob Young. Together with Coghlan the band also featured vocalist Phil May (ex-Pretty Things), guitarist Ray Minhinnett, Chris Stewart (ex-Frankie Miller and Joe Cocker) on bass, and keyboard player Hilly Briggs. The band toured regularly and performed a varied selection of material which included both cover versions as well as several original compositions, written by the band members themselves. On a typical night their live show would include such covers as; 'Big Boss Man', 'Steamy Windows', 'Bad Case Of Lovin' You (Doctor Doctor)', accompanied by self penned tracks including; 'Turn Me Loose', 'Ain't Got No Money' and 'One Way To Roll'. 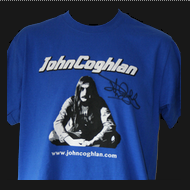 John Coghlan started working with his own band, John Coghlan's Quo, during the late 1990s. The band has since toured Europe and the UK successfully for several years with various line-ups. The current band since 2010 (previously performing as The John Coghlan Band) consists of John on Drums with Mick Hughes from NWOBHM Boogie Band ‘Predatür’ on guitar, Rick Chase on bass and vocals, and Rick Abbs on guitar and vocals completing the line-up. John Coghlan joined Francis Rossi and Alan Lancaster in their newly-formed band in 1962 and the group went through a series of names, including Traffic Jam, before meeting up with Rick Parfitt and becoming Status Quo in the late 60s. A long string of hit records, a plethora of albums, successful worldwide tours and television appearance followed for the next 20 years: the hits included Pictures of Matchstick Men; Down Down; Caroline; Rain; Rockin' All Over the World, and many more.